Today I received a couple of photos of New York from Allan Schultz - our coffee roaster and a connoisseur of life, poetry and the Chrysler Building. Allan and I share an obsession about that shiny deco-wonder and so we send each other pictures each time we visit the city. A confession, it's my obsession and I should lay claim to it - I once took over 50 pictures of the Chrysler Building as I walked from Central Park to Union Square - perhaps Allan just sends me pics of the landmark because he knows I'm so fond of it! Anyways, that was the beginning of today's New York moment! I've known Allan since The Beanery opened up on 14th Street in Eugene - in the former home of a "restaurant" called Mama's Homefried Truckstop. It was my first foray into the caffeine zone and obviously it made an impression! I've been devoted to Allann Brothers Coffee for close to 3 decades and I truly think you won't find a more flavorful cup of coffee anywhere - the Rainforest Certified Costa Rican is divine and the Main Street Blend is pure poetry in a happy cup. 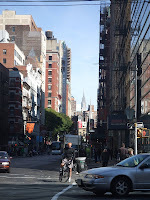 The next New York moment came when I checked one of my favorite blogs from Christophe Niemann. The newest art I LEGO N.Y. is SIMPLY sweet and I thought it was a perfect Valentine. You'll never look at Lego toys the same way again! Enjoy - drop me a note and tell me your favorite. The 'French Fries/Home Fries'' made me laugh out loud but I absolutely adored the 'Sorry, we just started a New Keg'. Good, simple and fun - ah, the sweetness of another NY Moment!